yes you read that title correctly! 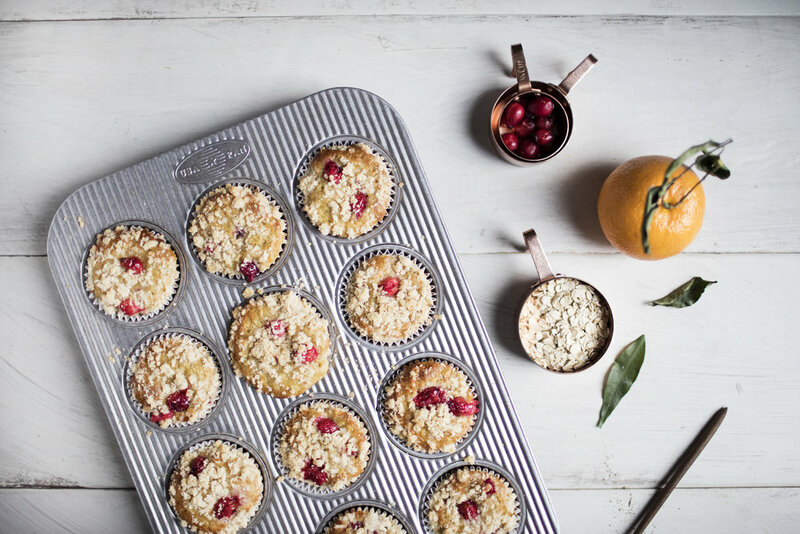 cranberry, orange, oatmeal AND streusel muffins. as if oatmeal muffins couldn't possibly get any better, i figured why not put an orange scented streusel on top? afterall, streusel makes everything better & when it's the holiday season calories don't count! these muffins taste & smell like a dream christmas morning, meaning you should probably make these on christmas eve. when it is time to wake up & open presents, these little muffins will be waiting for you! i just love the tartness cranberries bring to any baked good. whenever people tell me they don't like cranberries, i honestly cannot wrap my brain around it! they are sweet & tart all at the same time, what is there not to love?! to make these muffins i used *bob's red mills rolled oats & turbinado sugar. the turbinado sugar brings a much more natural sweetness to the muffins, with a little crunch. the crystals are much coarser than granulated sugar, so it makes a big impact to the streusel. for the orange flavour, the fresh orange zest is a must! so much of the scent, oils & flavour of the oranges is in that zest. be careful to only grate the orange zest & not the white layer, as that can become quite bitter. enjoy! preheat oven to 350 degrees. grease & line a 12 cup muffin tray. in a large mixing bowl whisk together the yogurt, orange juice, butter, sugar, vanilla & egg until well blended. add the flour, oats, orange zest, baking soda, baking powder, salt & nutmeg. stir until just combined. fold in the cranberries. evenly divide mixture amongst prepared muffin tray. set aside while you prepare the streusel. in a large mixing bowl add the flour, sugar, zest & salt. stir to combined. add the butter & using your hands work it into the mixture until a crumbly consistency is formed. divide streusel mixture evenly over the 12 muffins. bake for 18-20 minutes, or until the top bounces back to touch. store in an airtight container for up to two days in the fridge or two weeks in the freezer.